LinuxFests like this one in Ohio is just one of the many ways FOSS and especially Ubuntu users can get involved with the Ubuntu Community and at the same time experience the greater FOSS Communities. It's important to let people know that by attending an event like this you are supporting FOSS and participating in these communities. Everyone is welcome and whether you installed Ubuntu yesterday or you are a seasoned Linux developer we encourage you to attend, bring someone with you, and see what the world of Free and Open Source Software has to offer you and more importantly what you have to offer it. Earlier I chatted with Beth Lynn Eicher about the Ohio LinuxFest and UbuCon . 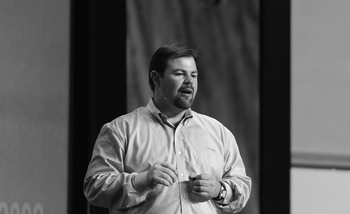 In this Interview I talk to Linux expert and Ohio LinuxFest planner Joe “Zonker” Brockmeier. Zonker takes a moment to share his thoughts about the Ohio LinuxFest - why it's important and how you can get involved. Zonker describes himself this way , "I’m a Software Freedom advocate and enthusiast. I’ve been using Linux since 1996 when I discovered Slackware Linux, and have been working with Linux and writing about it since about 1999." I think it would be easier to describe what Zonker doesn't do in the FOSS Communities rather than to list all the things he has done and continues to do. I haven't had a conversation yet with Zonker that I haven't learned something before the it ended. If you already know Zonker then you probably understand why I say that, if you haven't met him yet and you find yourself at an event with him then strike up a conversation; you'll be glad you did. Without delaying the interview any longer - Introducing Joe “Zonker” Brockmeier! Amber Graner: Zonker thank you so much for taking the time to give me and the readers of my blog your thoughts on the Ohio LinuxFest. 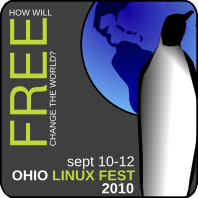 However, before we get into that can you tell us a little about you and your role with the Ohio LinuxFest ? How long you have worked on this event? Joe "Zonker" Brockmeier: I’m just this guy, you know? I write about Linux and open source, and used to work as community manager for openSUSE. I’ve been involved with Linux and open source for 14 years, and working as a reporter, editor, system admin, or community manager for 11 years. I’ve worked with OLF off and on since 2006, went to my first OLF in 2005 and was really impressed. Mainly I’m trying to help with publicity. JZB: Right now my day job is working as a freelance writer and consultant. AG: How did you get involved in FOSS? What was your first Open Source/Linux distribution and when? What do you use now and why? JZB: Slackware was my first distro and my first introduction to FOSS. I discovered it in college in the cheap software bin at a Hastings store in Kirksville, where I was attending Truman State University -- majoring in English and communications/journalism. I bounce around now -- I’m a “distro hopper” -- but I’m typing this on a Linux Mint system. AG: If someone wanted to get involved with the Ohio LinuxFest , how would they go about volunteering? What areas do you need the most help in? JZB: We’ll need a lot of help with registration the day of, and helping organize. We still need people to help spread the word about OLF by writing, blogging, tweeting, etc. Also -- everybody can help with this -- just make sure you register before attending! It’s a free show, but we can’t plan appropriately if people don’t register ahead of time. AG: What are some of the challenges you face when planning the Ohio LinuxFest and how do you over come them? JZB: I think Beth Lynn would be a better person to ask. Mainly, I just try to help with publicity. The big challenge I see is that everyone is a volunteer, and they’re trying to plan and assist with OLF while juggling a job, family, and other responsibilities. This has certainly been more of a challenge for me this year, and I’ve found it hard to find time for OLF. AG: How do you see the future of the Ohio LinuxFest ? What numbers do you hope to sustain? JZB: I think OLF has a great future ahead, if we get new blood. I’d like to see OLF continue to have around 1,500 people, maybe more -- but I’m not sure how many folks the venue can handle! AG: For people planning to attend Ohio LinuxFest what are the hastags you all are using for the Ohio LinuxFest for micro-blogging sites such as identi.ca and Twitter. Is there a Facebook Group? Where and what else can they do to help spread the word about the Ohio LinuxFest these final planning days before the event? JZB: Use #OLF10 when using microblogging services. There is a Facebook group and a LinkedIn group as well. Just tell people, blog, tweet, whatever comes naturally - if everybody who planned on attending OLF now spent 10 minutes a day telling other people by using Twitter/Identi.ca, saying something on Facebook, and emailing their friends and pushing folks to attend, we’d blow the roof off the joint! AG: Is there anything about the Ohio LinuxFest that I haven't asked that you would like to tell me about? JZB: Sure -- why is it important? The answer to that is that OLF is one of the few shows that address the audience in the Midwest. The major shows are usually held in California or on the East Coast cities like Boston. You know what? A lot of Linux and FOSS enthusiasts don’t have the cash to drop to travel from Ohio or Illinois or Indiana or Missouri to California or Massachusetts -- a $300 or $400 ticket, a couple of days off work, $189 a night for hotel (if you’re lucky!) and food - you’re looking at a $1,000 or more to attend a show -- not counting the cost of the event itself. I’ve been fortunate to attend shows all over the world, literally. Not everybody has that chance, but everybody should have the chance to get together with the larger community at least once a year and be energized by the community. We hope OLF will continue to energize the community in the Midwest and help keep FOSS vibrant here. AG: Zonker thank you again for taking time to answer my questions and as always it's a pleasure speaking with you. See ya the Ohio LinuxFest! !